Published: Nov. 18, 2018 at 08:20 p.m.
Detroit Lions wide receiver Kenny Golladay makes an incredible 19-yard touchdown grab, while falling backwards and with a defender all over him. Published: Nov. 11, 2018 at 03:56 p.m.
Detroit Lions quarterback Matthew Stafford tosses a 5-yard touchdown pass to wide receiver Kenny Golladay. 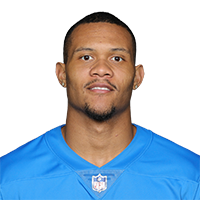 Published: Oct. 7, 2018 at 03:50 p.m.
Detroit Lions quarterback Matthew Stafford finds wide receiver Kenny Golladay for a 5-yard touchdown.